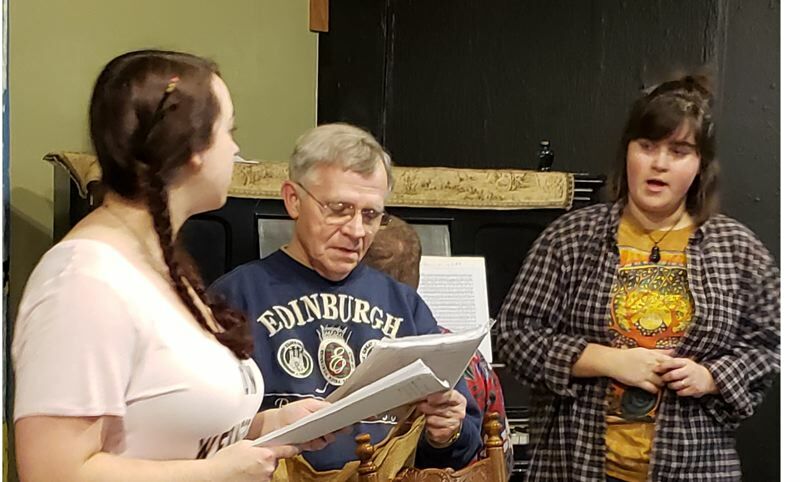 Sandy Actors Theatre's production of "And a Nightingale Sang" is a perfect reminder that life isn't perfect, but people do find ways of persevering. The very cast of the play proved this after having to replace one member right before opening night, yet still displayed great chemistry on stage. "And a Nightingale Sang" tells the story of the Stott family, who illustrate that life is, by nature, messy. Yet despite trials of the heart, and World War II air raids and explosive fights, the Stotts and their beaus dance, joke, sing, love proving anything is possible when you have family. "What is livin' but a way to pass the time," Grandpa Andie (played by Steve Morros) said. Andie provides much of the humor with his dry, and somewhat, grim wit. The entire family oscillates between taking themselves far too seriously and not seriously at all. Helen (played by Katrina Cannon) narrates the play and is also the character relied on by all for guidance and support, even though she is very self-conscious because of her limp and has little experience with romance. Throughout the war on the family's home — Newcastle-Upon-Tyne — both Helen and her sister Joyce find love, or at least what they think could be love, and lose it. Helen gains a greater image of herself by finding out she is desirable by men. The girls' parents, Mam and George, bicker but stand up for each other when others poke fun at them. With some adult themes and profanity, the play is probably most suitable for audience members ages 13 and up. But for those who do attend, Director Jonica Tabler hopes the story will be not only entertaining, but uplifting. "I think it's the message of 'No matter how horrible it gets, there's going to be a sunny day someday' that appeals to me," Tabler noted. "It's a play that's full of humor and pathos." There are still six chances to see "And a Nightingale Sang" at the Sandy theater, 17433 Meinig Ave. The play runs through Sunday, April 29, with shows at 7:30 p.m. Fridays and Saturdays and a 3 p.m. matinee on Sundays. Tickets are available at the door or online at sandyactorstheatre.org.